When I was starting work on Last Request, I knew that the story was going to have to be modern. 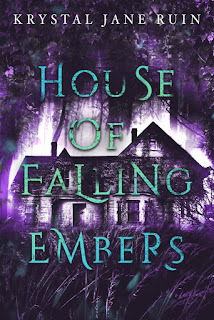 The characters were genuinely messed up and since I had a habit of inserting myself and my friends into any modern-set story I wrote, I wanted to really get into my characters' psychology because they were shaping up to be original characters, very different from anyone I knew. 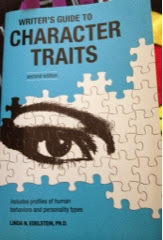 So I bought the Writer's Guide to Character Traits by Linda Edelstein. I took it out again recently in my quest to fill in the blanks of the male romantic lead in my upcoming NaNo project. I'm outlining it now. We'll see if I can avoid total first draft mess in November. As Edelstein writes in the introduction, the book is a quick reference of lists and paragraphs, detailing various personality types and behaviors, including mental disorders, the effects of ordinary and extraordinary situations, group influences, family, relationships, and careers. A person with agoraphobia (my female NaNo MC is apparently agoraphobic) doesn't like to do things by themselves, fears situations that are difficult to escape, fears having a panic attack in public. Of course, characters do not have to have all the traits listed under a particular category nor does a character need to fit neatly into a box. But psychology is, undeniably, a part of writing fiction. How does the world look to a particular character with a particular outlook? Because while I tend to develop my modern female characters really well--for whatever reason, in historical fiction, I don't have trouble writing men, I don't think--but in contemporary stories, the men all morph into whoever I'm Google stalking at the moment or whatever the last really gushy rom-com I watched was. And that's not cool. So I've been paging through the basic Adult Personality Type lists, mentally compiling a list of traits that I think might work with this guy character I'm brewing up. That's funny about the Google stalking. My male leads are always haboring some kind of secret. Lol! Not always a big secret, but there's always something and naturally whatever it is has the potential to cause a riff between them and the girly pants they're crushing on. I'm being optimistic. My first drafts are always messes. I think I have a touch of agoraphobia, too. I think she's telling me that it's something she's getting over because it emerged when she was a teenager, but it's definitely still hovering around in the background. Yeah, the Google stalking. And then I end up changing whoever it is that I'm stalking in the middle of the story and then guy ends up changing with the stalking, too. So this time I'm pinning him down now! I had no idea there was a book like this. I tend to do a lot of research when writing about something like schizophrenia. For personality types, I generally just go with my gut. Interesting to find out about this resource. I found it at a point when I felt I was writing the same characters over and over again. It's a good book to have for brainstorming or for all those "how can I create original characters" threads I see on AW.